After 3 alphas,2 betas and a release candidate, Ubuntu 10.04 LTS was made availbale to download on mirrors wolrdwide on Apirl 29. In Geekyard.com we published articles related to Ubuntu 10.04 Adds New Lightware Themes & Ubuntu 10.04 Radiance & Ambiance Themes For Google Chrome.In this article I have covered various features of this new release Lucid Lynx. Ubuntu 10.04 LTS is also the 12th release of the Ubuntu OS and, being an LTS (Long Term Support) release it will be supported for 3 years on desktops and 5 years on servers. New boot splash theme – Plymouth replaced Usplash. It is slicker, better looking. 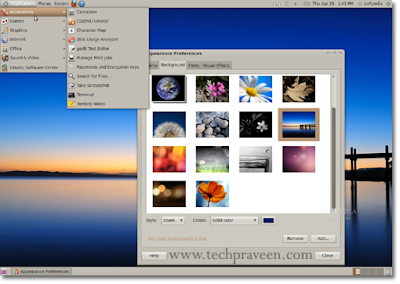 Ubuntu Software Center – Offers better descriptions and screenshots for many programs. Tomboy 1.2.0 (desktop note-taking application). Simple Scan 1.0.2 (scan, copy and fax images). Transmission 1.92 (lightweight BitTorrent client). OpenOffice.org Suite 3.2.0 (spreadsheet, presentation and word processor). Sound Recorder 2.30.0 (audio recording tool). Ubuntu Software Center 2.0.2 (software installer/updater tool). The new version is really looking great. I have listed some of the great features of the new version on my blog – Techchai.com.